Thanks so much for this thoughtful and thought-provoking proposal – and thanks for actually testing it on the Atlanta Hilton space! There’s a lot in here I totally agree with (and that we’ve already been considering – and then some, such as use of PK format and outlining very specific “top 10” goals for tracks.) The logistics of how to really have a good discussion session with a few hundred passionate urbanists baffles me a bit. 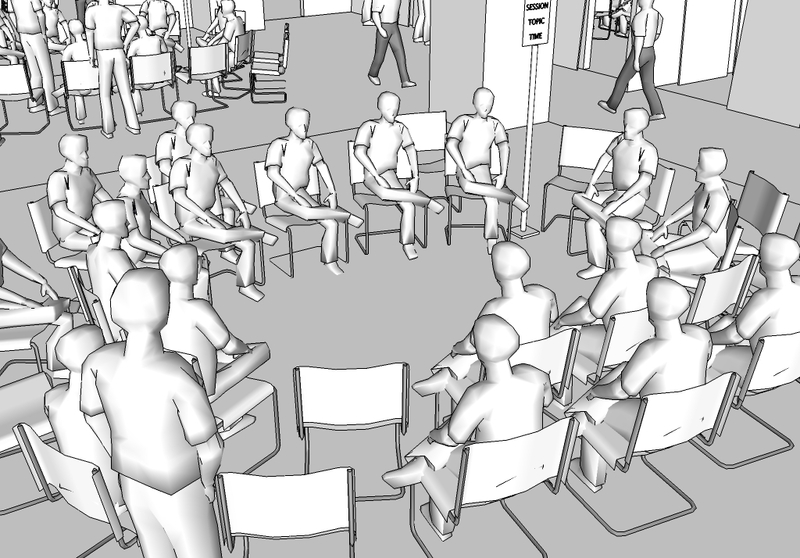 Maybe I’m jaded from trying to run faculty meeting discussions with just 30 people…An alternative is to similarly divide the room into sides facing off, but run it more like a debate or congressional hearing. Thank your for commenting. I think a forum like this for public comments on the issues, in the open, best addresses some of the ideas for the change needed. Its great to hear as well that you are looking into integrating PK. Nathan sent a message about the top 10 as well, which I am going to look into in a few minutes. Regarding the logistics, my reading of the topics simply generated the room distribution by category. If it were determined that more categories exist, they may be expanded, however I doubt that they will expand by much (I meant to post the chart). 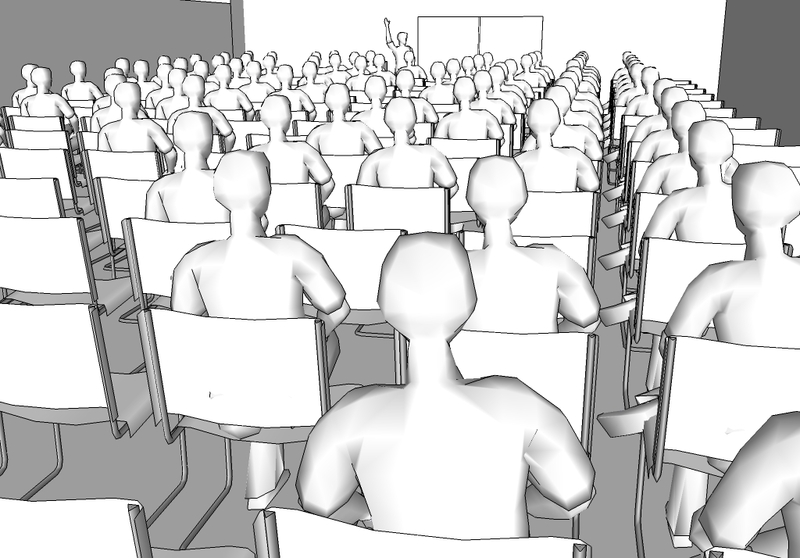 One important assumption is that the concurrent lectures, being well programmed, will draw a good deal of attention. 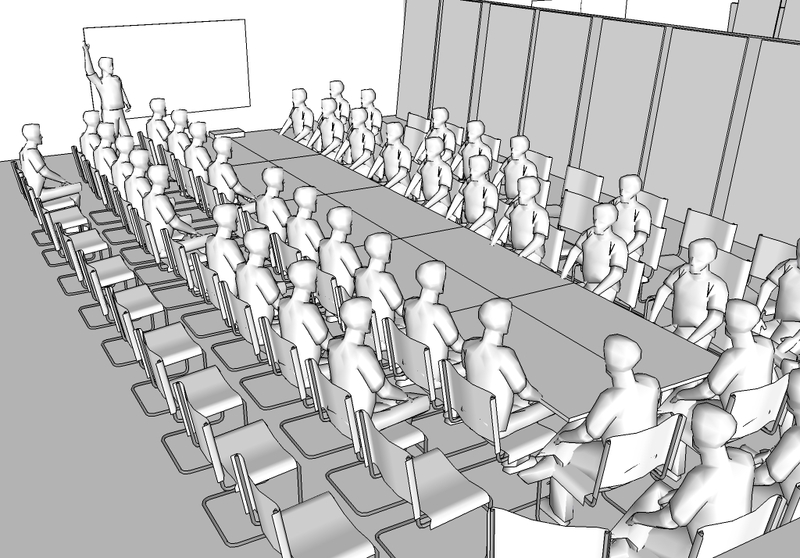 These take place in the larger ballroom and a medium size lecture room. Between these two, a good deal of attendees will be served. The topic rooms would still be large, however, if they are well managed / moderated, they can perform successfully. The Transportation Authorization session this year seemed to work well, but could have used more time. Similarly the session on Hipsters, though an outsider topic, elicited good comments and could have benefited from more time and a different layout. In any case much of the room atmosphere has to be handled by the team leaders of the day. For instance, some topics may benefit from a debate style layout – it would be up to either the team leaders to make it happen or for the participants to simply step-up and encourage a more successful form of discussion. As for the quality of discussion, you may notice that even in large lectures, there are relatively few people who contribute. Most people are there to learn through observation. An atmosphere that encourages more audience participation will, I believe, better educate the audience and the presenter alike. The test in the Hilton took the floor where the grand ballroom is located. 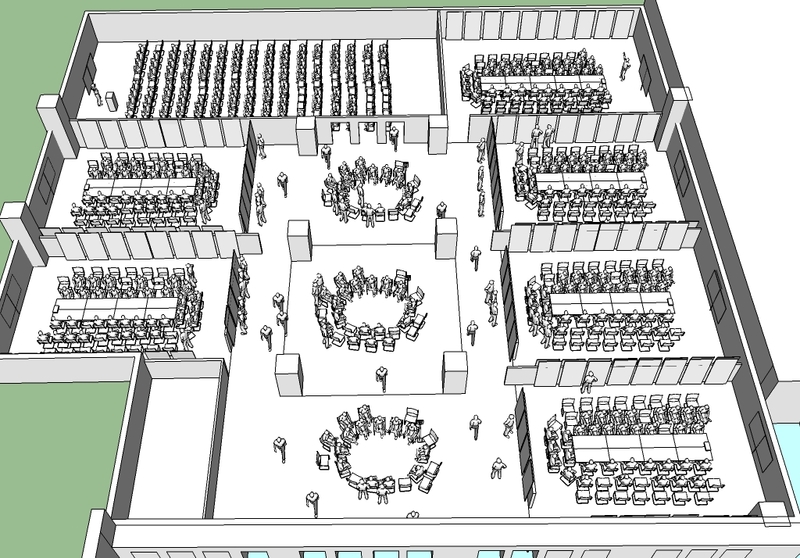 The grand ballroom is not pictured because I didn’t have the time to model it or the space between the ballroom and the secondary room where the renderings are shown. The bookstore and trade show would work well in this location, which is essentially to either side of the escalators. The main idea, however, is to concentrate the traffic flow in a central space that itself provides information and even topic orientation. Matt, these are very interesting, and generally on-topic ideas. I would add that time is a factor. It takes 90 minutes to lay out an unfamiliar subject, and 45 to explain a moderately complete, but basically familiar one. (This is why classes are often 50 minutes.) A dialog takes 90 minutes if it’s on a familiar topic, but 3 hours if it’s not. A minimal work session, then, would be 3 hours, including a break. Ever notice that the is-minute sessions always seemed is minutes too short? there’s a reason! Very true Bruce. The work sessions / topic room sessions intend to work towards a single goal for the day, which is communicated to the entire audience once in the morning and once in the afternoon. These will likely require a portion of the morning spent explaining the base that the session builds upon. One important point that may have been under-communicated is the introduction of visual/printed materials that serve as reference for newcomers to the topic and for those in discussion. @Matt, great article and nice renderings, I think they add a lot to explain the process to the uninitiated. I think this is an excellent concept worth discussing, but obviously it needs to be fleshed out a bit more? 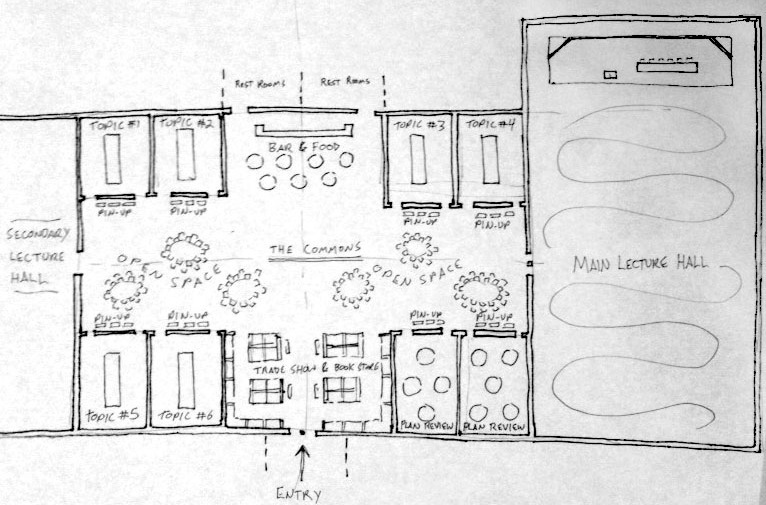 How many people do you (ya’ll) think we can reasonably accommodate with the suggested configuration? What about the plenary type keynote speakers; Is the largest presenting room big enough? How will this affect the cost of the congress? Are we using more or less space overall for the same number of people? What about printing services? Who pays for them or are we going to exclude them for the working sessions? What kind of goals do you think we could expect to see? My example: I would love to host a session on compiling a collaborative design platform that takes advantage of existing web apps. I think I would want to find a local developer to partner with like Peter French (for example) who has the property and is open to working out a new way to engage the world for the design process. In this example, the sessions would require people to assist with developing the process and people to build the software, models, interface and bridging the gap from each disparate app. That’s my very quick 2 cents, have to get back to writing change orders though. Nothing Like a crisis to motivate people to do the right thing. The Mississippi video was very moving centered on the recovery from a disater. In Atlanta, the US Judicial sytem has just ruled they will cut off our main water supply in three years unless a congressional act changes the current laws on the book. Is this a crisis about to happen? Can the CNU respond in Atlanta through a process similiar to above? Astounding effort! Look what a recession can do! The existing conference format is just a familiar fall-back position, reminding me of the university academic schedule: any time we try to invent a new delivery method – short courses, irregular credit hours, etc. – we are overcome by the complexity of coordinating and tracking student and faculty participation, and we fall back into the standard format. This is not an issue here, but it does serve as a reminder that if you want a large group of people to operate in a totally new way, it has to be very clear and user friendly! I think you may have hit it! Can we push for this in Atlanta? may I use modified versions of your sketches for my blog? Yes, but please link back to our site. Thanks for asking.